A poster advertising a San Francisco art gallery’s exhibition about the Chinese experience at Angel Island, 1976. The exhibition advertised in this poster was held during a time when the public became interested in the history of the immigration station. After World War II, Angel Island Immigration Station buildings were no longer used and fell into disrepair. The California Department of Parks and Recreation took over the island in 1963. In 1970, a state park ranger rediscovered the poems written on the walls and contacted local experts to research and document them. Asian Americans in the San Francisco Bay Area formed a committee to preserve the immigration station’s history. In July 1976, a few months after this exhibition closed, the State of California dedicated $250,000 to preserve the immigration station as a state monument. 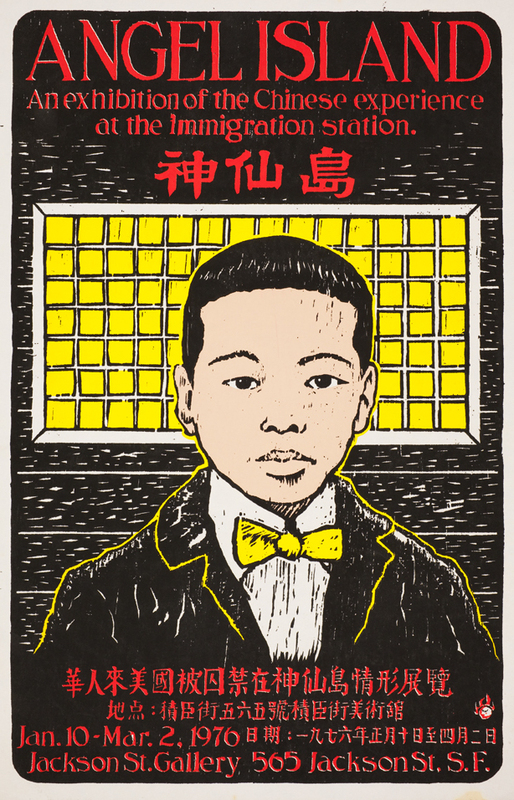 Wong, Leland, “Angel Island, an exhibition of the Chinese experience at the immigration station,” Digital Public Library of America, https://dp.la/item/88a3414d4bbf3acb5a235fa0c4937db8. Courtesy of UC Santa Barbara, Library, Department of Special Research Collections via California Digital Library. A 1901 letter from a Los Angeles banker asking US Secretary of State John Hay to reconsider a portion of the Chinese Exclusion Act. A letter from a Sing Fat & Company executive asking immigration officials to cancel sponsorship for two employees, 1905. An excerpt from Angel Island: The Ellis Island of the West by Mary Bamford, 1917. A photograph of immigrants arriving at Angel Island, 1939. A photograph of young immigrants standing outside Angel Island’s hospital, 1923. A photograph of an Angel Island dormitory room as it looked when the immigration station was in use, 2003. A photograph of immigration officials interviewing an Angel Island detainee, 1923. A photograph of a missionary conducting an English lesson for a group of immigrant women, 1933. A photograph of a Chinese poem carved into an Angel Island dormitory wall by a detainee. A photograph of the Lee family, including their “paper son,” in San Francisco, ca. 1920. A photograph of the Angel Island administration building soon before the station’s closure, 1930s. A photograph of the Angel Island administration building on fire, August 12, 1940. A photograph of a note left by a Japanese prisoner of war held at Angel Island during World War II. A photograph of a former Angel Island detainee returning with his family, 2003.